Tag line: "Moviemaking is no way to spend a life"
These are the words of the great Orson Welles, who, for decades, fought tooth and nail to make the kind of movies he wanted to make. In the 2005 documentary Horror Business, we meet a handful of filmmakers who are trying to do the same. Directed by Christopher Garetano, Horror Business takes us into the world of independent horror, following several directors as they work diligently to complete their latest projects. Wisconsinite Mark Borchardt, who in 1999 was the subject of the hit documentary American Movie, has gathered family, friends, and a collection of extras together for his newest opus, Scare Me. New York’s David Stagnari puts the finishing touches on his black and white short Catharsis, while Las Vegas’ own Ron Atkins shoots scenes for his next film, The Sins of Government. We join these three (and a few others as well) on the sets of their respective movies, watching them deal with the sometimes frustrating process of making a motion picture, and listening intently as they try to explain why they love it so. 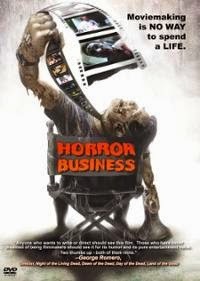 Along with the above, Horror Business delves into other aspects of the horror genre, showing clips from a number of classics (Nosferatu, 1931’s Dracula, The Texas Chain Saw Massacre, Zombie) while also speaking with such noted celebrities as Herschell Gordon Lewis (Blood Feast), Lloyd Kaufman (The Toxic Avenger), and cable TV host Joe Bob Briggs, who offer advice to all the would-be directors in the audience. Horror Business even swings by a convention, where Sid Haig (Spider Baby, House of 1000 Corpses) interacts with fans; and we take a stroll down memory lane by visiting New York’s Warwick Drive-in, where David Stagnari spent a good portion of his youth. As much a tribute to the genre’s illustrious past as it is a glimpse into its future, Horror Business leaves no stone unturned. A flashy, engaging documentary that approaches its topic with the utmost respect, Horror Business is an incredibly satisfying journey into the heart of independent horror, showing us there are still people out there making films not for the money, but because they love them. Horror may indeed be a business to some, but to a select few, it’s an all-consuming passion.